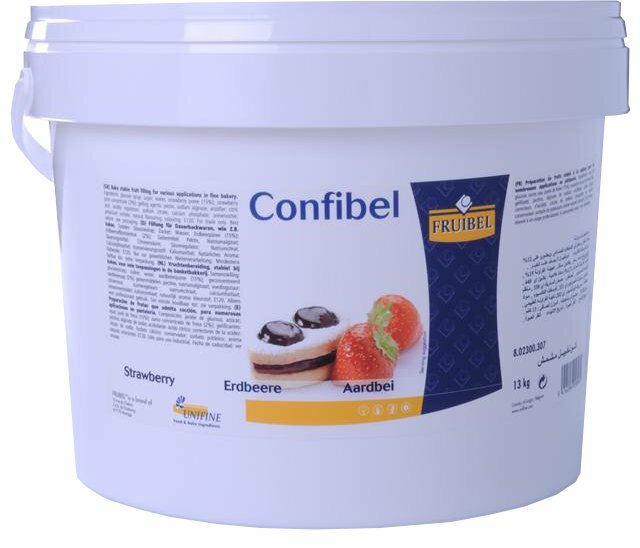 Confibel is a range of multi-purpose jams for bakeries. Prepared with fruit purée, Confibel is a highly bake stable jam. It has a soft texture, easy-to-apply and is freeze-thaw stable. Juice Concentrate (2%); Gelling Agents: Pectin, Sodium Alginate; Acidifier: Citric Acid; Acidity Regulators: Sodium Citrate, Calcium Phosphate; Preservative: Potassium Sorbate; Natural Flavoring; Coloring. Ideal for filling all kind of baked products.